Most of my cookies, regardless of the final result, begin with the same reassuring formula. Combine dry ingredients and set aside. Cream softened butter and sugar until pale and fluffy. Add eggs, one at a time, along with the flavorings. Gradually stir dry ingredients into butter mixture until well incorporated. Finally, fold in nuts, chips, fruit, etc. To me, these are the simple, tried and true steps for cookie-making magic. In the 2007 edition of Better Homes and Gardens Christmas Cookies publication, a shortbread recipe caught my eye. I’d never made shortbread before and it seemed like it would be a fun challenge. Besides, the cookies in the magazine photo looked so darn cute, I couldn’t resist. This recipe took me far from my comfort zone. Freeze the butter? No eggs?? Knead the dough??? I don’t need my Kitchenaid mixer?! Very scary stuff, I’m telling you. However, after taking the plunge, I can confidently say that there is more than one way to bake cookie magic in my kitchen. These cookies are definitely worth the extra fussing. Their subtle strawberry sweetness and tender shortbread texture make them pop-in-your-mouth yummy. The bonus – they’re pretty enough for very special occassions. At my house, a true test of a cookie’s deliciousness is how quickly it disappears. All seventy some cookies were gone in less than 48 hours. Now that is cookie magic at its best! 1. Snip large pieces of fruit in the strawberry preserves. Beat butter, preserves, and almond extract in a large bowl with an electric mixer on medium speed until well blended. Transfer butter mixture to a sheet of plastic wrap; shape into a six-inch log. Wrap and freeze for 1 to 2 hours or until firm. 2. Preheat oven to 325 degrees F. Stir together flour, granulated sugar, and salt in a large bowl. Add butter mixture. Cut butter into flour mixture with a pastry blender ubtil mixture starts to cling together. Knead dough until smooth; form dough into a ball. 3. Divide dough in half. Roll each portion of dough to 1/4-inch thickness on a lightly floured surface. Cut out dough rounds with a scalloped 1 1/2 to 2-inch cookie cutter. Place cut-outs 1 inch apart on ungreased cookie sheets. 4. Bake in a pre-heated oven for 12 to 16 minutes or until edges just start to brown. Transfer cookies to wire racks and cool completely. 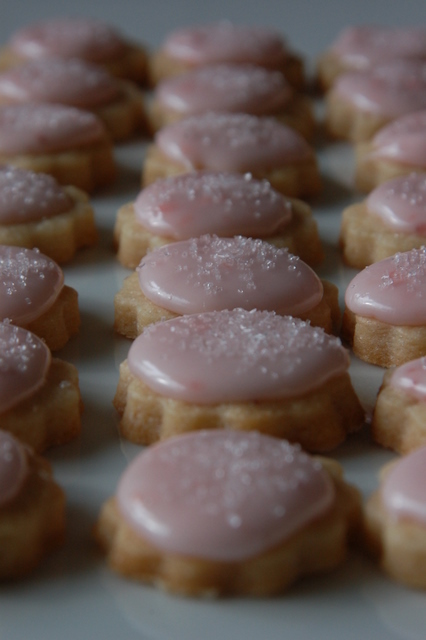 Spread tops with Strawberry Glaze; if desired, sprinkle with coarse sugar. Let stand until set. Makes about 54 two-inch cookies or seventy-six 1 1/2-inch cookies. Microwave 1 tablespoon of strawberry preserves in a medium microwave-safe bowl on 50 percent for 30 seconds or until melted; snip any large pieces in the preserves. Stir in two cups of powdered sugar and 1 tablespoon of milk using a wire whisk. Stir in additional milk, 1 teaspoon at a time, to make a smooth glaze of spreading consistency. Makes about 2/3 cup. I made a few changes to the original recipe when I baked up my batch. Instead of the preserves, I used homemade strawberry freezer jam. I also substituted vanilla extract for the almond variety – I’m not a big fan of almond flavoring. The process of cutting in the butter and turning the mixture into a kneadable dough takes some time and muscle. Just be patient and don’t be afraid to get your hands dirty. Whenever I wasn’t working with the dough, I kept it cold in the fridge. I rolled each half of the dough out only twice to keep the cookies from getting tough. With a 1 1/2 inch scalloped cookie cutter, I made about seventy-five cookies. I’m sorry I don’t have an exact number. I began counting after I had already eaten several directly from the hot cookie sheets. Finally, for the glaze, I used at least two tablespoons of milk to create the desired spreading consistency. There was more then enough glaze to cover the entire batch – even the ones I ate right out of the oven had they actually lasted that long.